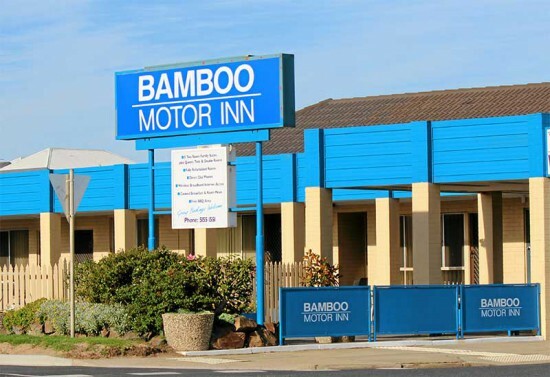 The Bamboo Motor Inn provides good value, clean, comfortable and affordable accommodation in Lakes Entrance. Suitable for families, Backpackers and groups, or the travelling corporate guest, we're a friendly Motel on the Princes Hwy, Lakes Entrance. Very close to all restaurants and supermarkets. All rooms are spacious and clean. We have 16 rooms and all are ground floor with walk in showers. We also provide wheel chair access. During your stay here with us, there are plenty of places to visit. 30m to the Lake, 200m to the V/line bus stop, 400m to Safeway, Cafes and Restaurants, Hire boats, fishing, Charter Cruises within 200m.